Last year, we reproduced an earlier version of this Stratfor map in The geography of drug trafficking in Mexico. The recently released new version, shown below, shows several changes from the earlier version. Drug routes in Mexico. Copyright Stratfor. Click map for enlarged version. Map © Copyright 2010 Strategic Forecasting Inc, STRATFOR www.stratfor.com. This map is republished with permission of STRATFOR. does not show the territories controlled by each of the major drug cartels. As we have noted previously, the boundaries between cartel territories are hotly disputed and in a constant state of flux. shows more marijuana traffic originating from Jalisco and Michoacán states. adds a new route for ephedra trafficking from Central America through Guatemala and along Mexico’s Pacific Coast towards Acapulco. 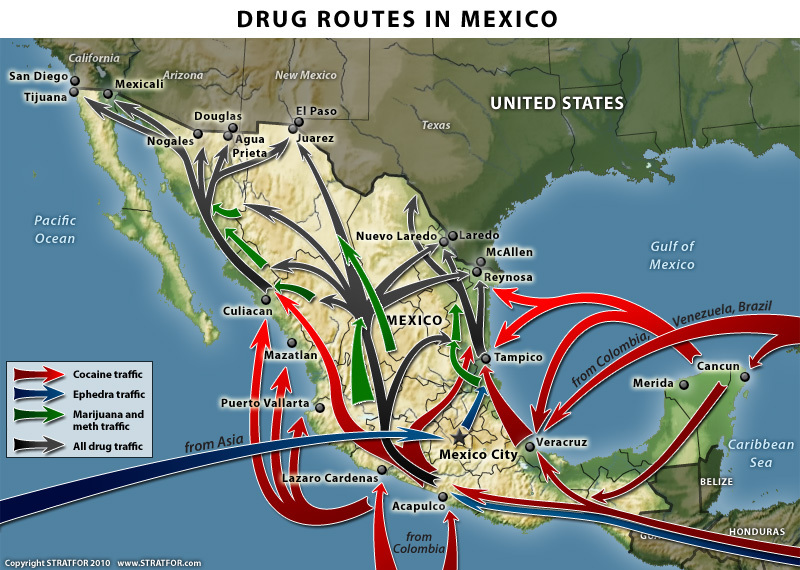 strengthens the arrows showing a much larger movement of “all drug traffic” northwards from central Mexico through Chihuahua state and towards the border city of Ciudad Juárez, with branches of this flow extending not just to the Pacific Coast (as in the old map) but also to the Gulf Coast. First, it is apparent that the overall pattern of drug trafficking routes is more complex than originally thought. Shifting alliances between trafficking groups means that the “map” is being constantly redrawn to reflect the changing relative strengths of the different cartels and drug gangs. These shifts in routes, and in the zones at the margins of each cartel’s territory mean that the focus of drug-related violence in Mexico is not limited to fixed locations, but that virtually anywhere in the country could find itself “in the wrong place at the wrong time” at some point in the future. This is quite different to the pattern of drug-related violence 30 or 40 years ago, when most of the problems were concentrated in a relatively small number of generally isolated areas where the drugs were actually grown. To read more posts about the geography of narcotic drugs in Mexico, use the “drugs” tag in the navigation bar on the left hand side of each page. Geo-Mexico: the geography and dynamics of modern Mexico discusses drug trafficking in several chapters. A text box in chapter 20 looks at the drug trafficking business and efforts to control it. Buy your copy today to have a handy reference guide to all major aspects of Mexico’s geography!